Many of our customers end up flying into Ft. Lauderdale or Miami since the fares are often less than Key West. If so, you can take the Keys Shuttle, Greyhound bus, or rent a car and drive down. We've had requests for sights to see along the way, so we thought we'd post some of our favorites. 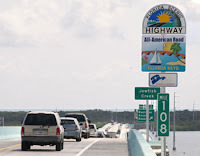 You’ll want to leave plenty of time driving down the 100-mile Route 1 Overseas Highway that island-hops the Florida Keys to Key West, the southernmost point in the Continental US. For one, it’s a gorgeous drive, recently named a Great American Road. For another, the speed limit is 45 to 55 with plenty of speed traps! Once you get off the Florida Turnpike in Homestead, you have a choice: the 18-mile recently redone “Stretch” or Card Sound Road, a toll road that costs all of a buck. If you take the Stretch, stop in at Gilbert’s tiki bar; if Card Sound, pull into Alabama Jack’s, a funky watering hole amid the mangroves. Keep your eyes fixed on the creek below for colorful fish and a manatee may even glide silently by. You’ll start to notice numbered small green signs on the side of the road. 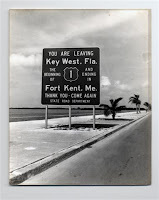 These milemarkers start on the Stretch, around 112, and go down to 0 in Key West. It’s a great way to give directions in the Keys. There’s ‘bayside’ for Florida Bay, on your right if heading south, and ‘oceanside’ on your left, referring to the Atlantic Ocean. At mm104 bayside is the famous Caribbean Club bar where portions of the Bogey and Bacall film Key Largo were filmed. Despite it’s claim to fame, it’s refreshingly un-touristy and family-owned for nearly a half-century. There’s usually some Harleys parked outside, dogs are welcome, and there’s a flock of wild parrots that perch above the waterfront picnic tables. Pop into Florida Bay Outfitters next door, a really neat kayak shop that sells our “Florida Keys Paddling Atlas.” Tell them Mary and Bill sent you! North America’s only living coral barrier reef draws divers and snorkelers from all over the world to John Pennekamp Coral Reef State Park at mm 102.5 oceanside. Even if you don’t take the boat out to the reef, the park is a great introduction to the flora and fauna of the Keys, with nature walks and kayaks trails through mangrove tunnels, a small aquarium, and two beaches. While fishing is legendary throughout the Keys, Islamorada is the ultimate destination for a deep-sea sailfish adventure, fly-fishing for tarpon in the nearby Everglades or flats fishing for bonefish. World Wide Sportsman at mm 81.5 bayside is a fun place whether you fish or not. It’s one of the more unique in the BassPro Shop chains, where you can step aboard the "Pilar," sister ship to Hemingway's famous fishing boat, or dine at the elegant Zane Grey Lounge overlooking the marina. Robbie’s Marina, mm 77 bayside, is the jumping off point for a boat or kayak trip to Indian Key, the island ruins of the first seat of Dade County. A visit to the Keys isn’t complete until you feed the giant tarpon that wait off Robbie’s dock. 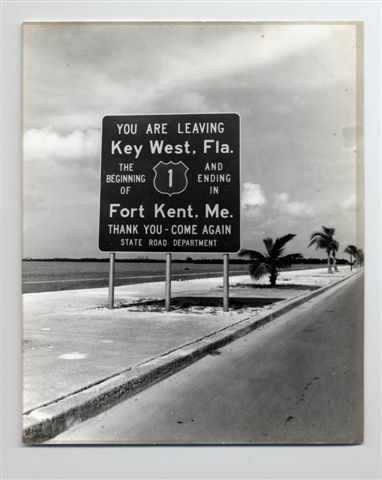 Once you cross the spectacular 7 Mile Bridge from Marathon, you've entered the Lower Keys. This is where we do our Backcountry kayak trips, and where you can see the endangered Key Deer. Stop in at the Key Deer Wildlife Refuge Headquarters on Big Pine Key to learn more. Cats jumping through flaming hoops, fire-eaters, clothing-optional bars. There’s no place quite as “ultimate” as the southernmost city in America, from the nightly Mallory Square sunset celebration to the Duval Street “pub crawl”. Wherever you choose to stop on your Florida Keys road trip, shoes are optional and the sunset lingers.